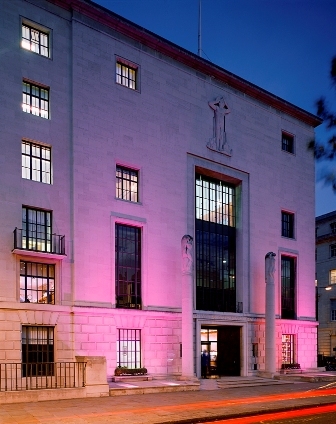 The RIBA headquarters on 66 Portland Place is unsurprisingly one of the most iconic buildings in London. Home to the Royal Institute of British Architects, it was conceived by the architect George Grey Wornum (1888 - 1957) whose design was judged the best of 3600 entries in a competition for the new RIBA headquarters. Completed in 1934, it is one of the most elegant expressions of Art Deco architecture in the City. Unknown to many, the RIBA houses a stunning restaurant, bar and cafe which can be accessed by members and non-members alike. There are also architectural events, talks, and exhibitions as well as an extensive bookshop and library open to the public. I was recently invited to take part in a guided tour of RIBA's latest exhibition "A Place to Call Home" which is running until the 28th April. This fascinating exhibition charts the story of the design of everyday homes in the UK. It explores the British obsession with homes and the experiments that have shaped how and where we live. The invite coincided with "Last Tuesday" at RIBA when the Institute opens its doors after hours for everyone to enjoy. 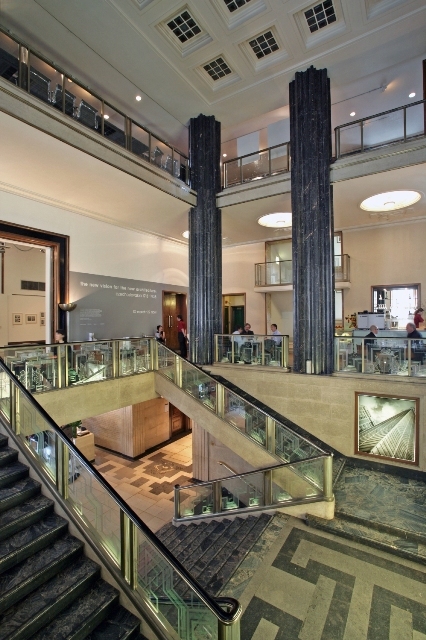 There is a wide range of special activities and events on the last Tuesday of each month at RIBA, including free guided tours, exhibitions, talks and film screenings. 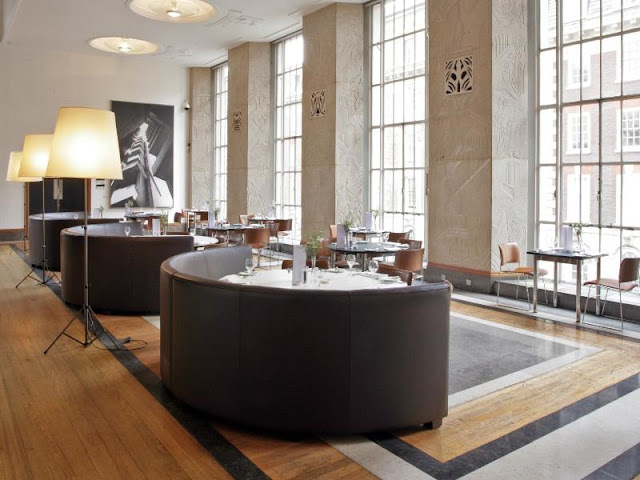 It is also a great opportunity for those interested in visiting RIBA's stunning Art Deco building, or simply meeting friends for a drink in the bar, or enjoying a bite to eat in the restaurant. Admission is free (some special events are charged). Visit architecture.com/programmes for full information. After the exhibition we headed to the bar for a glass of wine and to check the available menus. There is a special menu designed for "RIBA Last Tuesday" with a selection of small plates (tapas style) which in my opinion is well priced at £3.50 per dish or 3 plates for £10. A large glass of wine (250ml) is priced at £7 and if two are purchased, the remaining bottle is given free. This works out at £14 for a bottle of wine! The restaurant also has a more substantial a la carte menu with a choice of four starters (from £5.50 to £6.50), four mains at around £18 each and four desserts priced at £5. From the RIBA Last Tuesday menu we ordered 3 small plates including "Rillette of duck, spiced plums, and toasted croutes", "Smoked haddock and chive omelette with Wookey Hole cheddar" and "Beer battered Cornish squid with tartare sauce". These were beautifully accompanied by a couple of glasses of South African Chenin Blanc from Stellenbosch (War Horse). The a la carte menu looked too tempting to be left untouched so we made our way to RIBA's beautiful Art Deco restaurant. The restaurant is imposing, with floor to ceiling windows overlooking a gorgeous open air terrace. We started with "Seared scallops" @ £6.50 served with leeks, candied hazelnuts and black olive powder. The scallops were deliciously tender, and I enjoyed the unusual addition of candied hazelnut and olives. The "Middle white pork belly" @ £5.75 served with black pudding and quince was also very good and had perfect crackling. For mains, we went for "Pan-roasted Cornish pollack fillet" @ £17.95 which was accompanied by a crayfish and tarragon lasagne, salsify crisps and crayfish reduction. The "Braised Yorkshire venison" @ £18.95 was however the better of the two mains. It was served with sauteed girolles, truffled mash and redcurrants. This was a fabulous dish. We also had a selection of three British cheeses @ £7.50 which included Wookey Hole cheddar, Oxford Blue and Sussex camembert. They were beautifully presented and served with grapes, dried apricots, walnuts, biscuits and jam. To finish off we shared a dessert of "Warm orange and polenta cake, passion fruit sorbet and candied orange" @ £5.50 which was also delicious. I was surprised to find such appealing food at affordable prices in one of the most stunning locations in London. 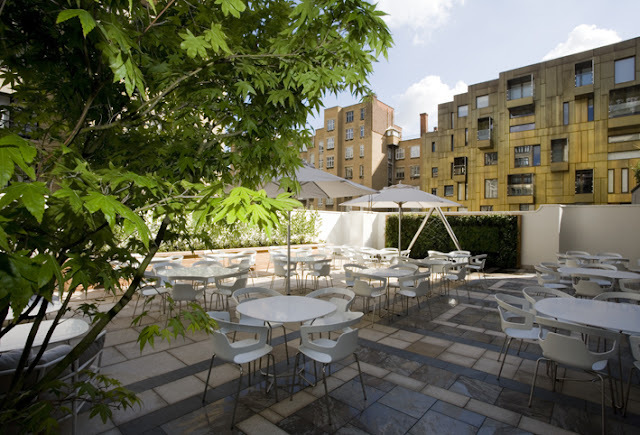 I will make sure to return and make the most of RIBA's open air terrace this coming spring and summer, to further sample their affordable wine list and food offerings. A hidden gem, recommended! Please note - the restaurant is opened at lunch time throughout the week and on Tuesday evenings only. Thats Why the people reach the RIB'A Restaurant..? Wow that food looks amazing- particularly like the look of the cheese and biscuits! And what a beautiful building. Darling this venue looks gorgeous! Who knew?